Bought from the artist by Morby in 1865 (£300). Mary Mckerrow, The Faeds: a biography, Edinburgh, 1982, p. 147. The subject is taken from Shakespeare's play, Cymbeline. 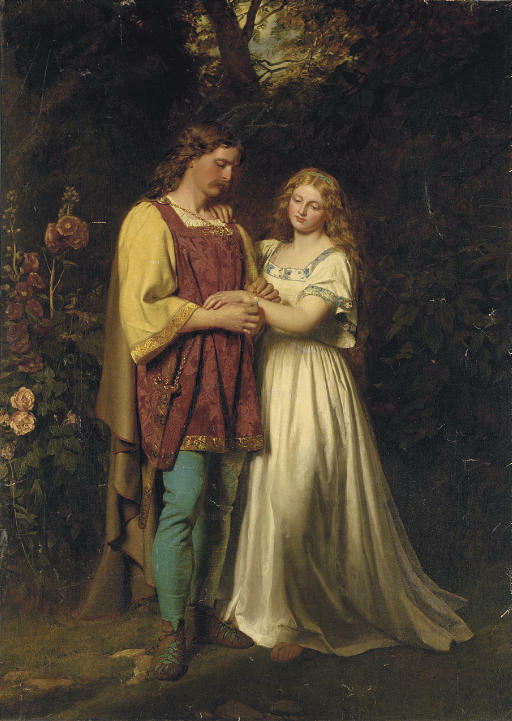 It depicts the moment when Posthumus has been banished from Cymbeline's kingdom. He gives a bracelet to Imogen (Cymbeline's daughter) who he has secretly married, in exchange for a ring of hers, and promises to return to her. He then flees to Italy, while Imogen departs to Wales, there both to undertake separate adventures as the play continues. John was the eldest of the three Faed brothers who achieved fame as artists in the mid-nineteenth century. Beginning his career as a miniature painter in Galloway, he settled in Edinburgh about 1841. He was elected an Associate of the Royal Scottish Academy in 1847, and achieved full membership four years later. In 1855 he began to exhibit at the Royal Academy in London, and in 1864 he moved to the metropolis, joining his brother Thomas, who had lived there since 1852 and was now a successful Royal Academician. John remained in London until 1880, continuing to show at the Royal Academy and Suffolk Street. He was fond of historical themes, and frequently exhibited subjects from Shakespeare and Sir Walter Scott.